The only sticky and gooey thing that all of us, equally adore in the world are chocolates; in any form, anywhere from our mouths to bodies and onto our faces. (You see what I did there?) There wouldn’t be any occasion where you wouldn’t find yourself gobbling down delicious chocolates, be it a massive heartbreak or that box of chocolates your sweet aunt got you on Diwali or coming home to a tub of chocolate ice cream after a tiring day at work. Seems like the solution to everything, doesn’t it? Remus Lupin said it right, “Eat the chocolate. You will feel better.” TRUTH HAS BEEN SPOKEN! For cocoa lovers like you and I, the world celebrates International Chocolate Day or World Chocolate Day on 7th July every year and it is all about the consumption of your favourite! On this occasion, I have summed up some insane things to try out around the world and it is all about chocolate and nothing else. Here are 6 things to try out this Chocolate day around the world. Pennsylvania is the home to the world-famous chocolate house, Hershey’s. It is so popular that there is a street named after the creator of the Hershey’s chocolate named Hershey’s. If as a kid you were wondering what would it be like to go into the witch’s chocolate house like Hansel and Gretel then Hershey’s street is your answer. The smell of fresh cocoa permeates the air like a natural phenomenon but it is not just limited to Hershey’s kisses and chocolate martinis. The Hotel Hershey’s has gone as far as to introduce Chocolate Spa, Whipped Cocoa Massage, Chocolate hydrotherapy and world’s first edible chocolate facial. These leave you smelling so delicious that you would want to take a bite out of yourself. Can you imagine taking a bite out of that whipped dark chocolate that has been plastered to your face and your face ends up giving a lovely cocoa-kissed glow?! That is how my ultimate paradise would look like. All you have got to do is lay down against the bed wrapped in towels as the yellow walls of the room are lit up with the baked sunlight that enters your room and a special chocolate martini in your hand, you are all set to relax and rejuvenate in your special spa. Chocolates seem to have an interesting history, a story filled with crazy roller coaster rides. Known to have started in early Latin America as a part of the Mayan empire, did you know those initial chocolates were spicy? Ditto, I didn’t know either. The Chocolate Museum in Barcelona tells the tales of all the strange chocolate theories and their history from Latin America to Spain. Check out the chocolate museum in Barcelona to get an insight to the history of these luxuries as well as experience the loving taste of newly made warm chocolates and wine in the special chocolate and wine tasting sessions. Apparently, the entry to the museum is by a ticket made out of chocolate and as you enter, you are surrounded by beautiful chocolate made sculptures. Although the place doesn’t have much to see, it is a quick escape from the heat of the city and every chocoholic’s dream surrounded by the aroma of cocoa. Don’t forget to try out a spa KB Centers on Carrer de Mallorca, 180, where they’ll cover you in a relaxingly warm chocolate, but not just any old chocolate, no, one that’s adapted to your skin. It’s full of antioxidants, great for your cutis! Of course, who hasn’t heard of Cadbury? We have practically grown up with it! Starting from every relatives’ safest option to gift on any occasion to the feeling of melting chocolate-y romance that we got from Dairy Milk Silk’s ads. It is then a childhood dream come true when I tell you about the Cadbury World in the UK. It is situated in the historic site of Bournville, a countryside village four miles away from Birmingham where Cadbury started its legacy. The place comes with astounding attractions and chocolate demonstrations. You get to travel back in time to the first of Cadbury products sold in Bull Street and you get to experience the highest level of the digital world where you interact with your chocolate in the most digital way possible in the Purple World. Don’t forget to learn the manufacturing recipes! They are as fascinating as they are delicious. Take a tour of the world’s largest Cadbury shop and customize your own souvenirs made out of chocolate. What is more satisfying than making your own chocolate in any shape you want! Cadbury World even presents a special breakfast with their Cadbury characters in the most British way possible, with a tea in their own cafe! It is possibly the reality version of the Willy Wonka’s chocolate world. How far would you go in tasting chocolates? Cow milk is what most of the chocolates contain but have you heard of camel milk? Well, considered “liquid gold” in the Middle East, Camel milk is rather difficult to obtain because of how much milk camels actually yield which is a fraction of how much cows do. Moreover, it is known to contain more vitamin C and is rich in iron! Al Nassma is the first and only company in the world known to use camel milk as their luxury ingredient in their specialty chocolates. Rather than directly melting in your mouth, the malted chocolates are rather flaky at the start but as you indulge more and more into it, it becomes smoother as it melts. You wouldn’t want to keep it for too long as the milk easily ferments and would have a salty taste. It is rather complex to work with hence a luxury you have got to try out! Next time when you are traveling to the Middle East, save some for these. Strange lines of desserts in the middle of the mysterious desert, all to satisfy your lusting sweet tooth! The Middle East never fails to awe-spire you. You know how when we were kids and would dream of swimming in the silky smooth chocolate river while laying on our back just like in Charlie and the Chocolate Factory. It would be a dream to feel relaxed and at the same, EAT together (especially for a lazy person like me), wouldn’t it? Well, Montreal has turned our fantasy into a lustful reality by opening its first Chocolate Bath in Spa Centrale. This therapeutic spa immerses you in Belgian chocolate and essential oils and just like consuming chocolate it is useful for stimulating and energizing you. Not only is it helpful in regenerating your body but also leaves a soothing cocoa smell making you as tempting as the chocolate. Moreover, you are free to get a partner along for you to take it a little outside your bedroom walls (Just a clarification, it is still a public space where you might want to control your hormones). There are 30-minutes and 45-minute baths that each cost $55 and $65. However, if you wanted to bring a partner with you a 30-minute dip is $90, 45-minute is $110. Which, I am assuming a lot cheaper than trying this at home. 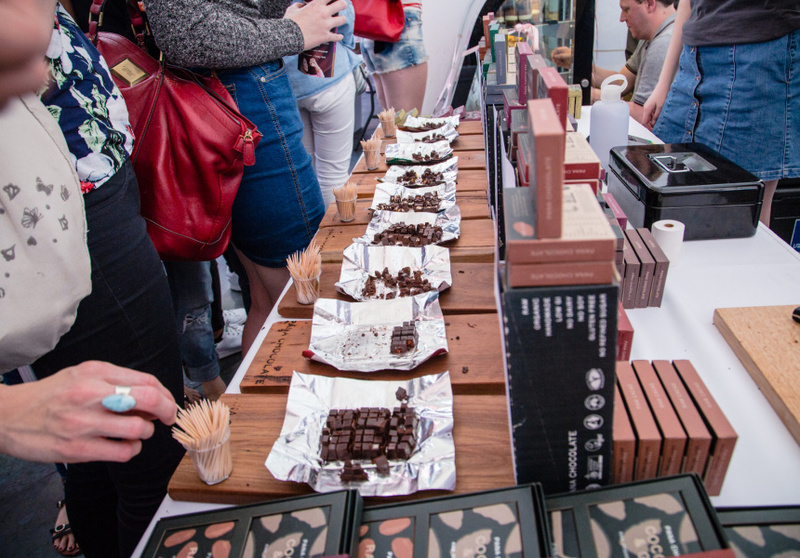 In Melbourne, Australia, people enter a crazy chocolate eating competition and you can go on eating how much ever chocolate you want but the catch is, in a limited period of time. You know how parents often told us not to eat so much chocolate because that would ruin our teeth? Well, there is nothing to stop you here! It is rightly named “wicked” because it is the ultimate seduction technique to lure a foodie in. All you see, smell, taste and enjoy everything chocolate. The competition starts with providing each of the competitors with 500 gms of chocolate which they have to finish in 2 mins. However, eating is only one part of the whole thing, it is the range of the chocolate products which will make you go gaga. Starting from normal chocolate bars, there are strange inventions of chocolate from chocolate base pizzas and choco salted caramel lollipop to chocolate blended cocktails. It is all about how much you can eat and relish! So for all you chocoholics out there, you know where to plan your trip to next to satisfy those sweet craving taste buds of yours. Let me know in the comments which of the above amused you the most or share your own chocolate experiences with me! Download Trell app to read more such personal ventures! Previous articleSix Weird Experiences In the World That You Can Add to Your Bucket List! Thank you! I hope you get the chance to see these for your yourself!